Stop The Stink In Elmira For those who are opposed to the location of the Proposed “Waste Disposal Facility” that Bio-En Inc. wants to build in Elmira, Ontario, Canada. #TIL about the #RationalWiki in reading one of @indi's articles on Religious Articles Ban. https://www.canadianatheist.com/2019/04/religious-accessories-bans-1-what-are-religious-accessories-bans/ The part that got me started down the #RationalWiki rabbithole was #FractalWrongness: https://rationalwiki.org/wiki/Fractal_wrongness Thanx, @indi! bobjonkman favorited something by platypus: "Remember: If it's not ISO 8601, it's not a date, it's just hanging out"
And only two months ago. Obviously that was not a memorable experience for me. 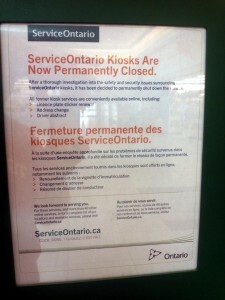 The Ontario government has announced it is shutting down the ServiceOntario kiosks. Closing the kiosks won’t do any good if the web site is no better secured. ServiceOntario had control over the hardware and software running on the kiosks, but they have no control over the computers people use to access the ServiceOntario web site. User PCs will have all sorts of malware running on them, and malusers can far more easily spend time breaking into a web site than a kiosk. Unless ServiceOntario has much better security on their web site, it is far more vulnerable than a kiosk. In his article Government to discontinue ServiceOntario kiosks, Sameer Vasta asks if the ServiceOntario web site is ready to pick up the slack. His conclusion is yes, and although the web site user experience could be improved, he considers closing the kiosks a prudent move. But if the kiosk interface was so much easier to use, then the web site could use that interface too. Security isn’t created by the user interface — security needs to be built into the servers. Malusers are unlikely to use the web interface to launch their attacks; they’ll have more sophisticated tools to try to break into the servers. Of course, since the ServiceOntario web site was already in place while the kiosks were operational it has been a potential vector for attack all along. Closing the kiosks doesn’t increase that vulnerability. And the vulnerability that prompted the government to shut down the kiosks was card skimming, which is not an issue on a Web site accessed from home. But shutting down a fully managed kiosk to be replaced by home users’ PCs that are full of malware does not look like a prudent move to me. However, it should be cheaper to manage security on one web site than on 72 kiosks. The government reports that shutting the kiosks will save taxpayers about $6.3 million in one-time upgrading costs and $2.2 million in annual maintenance costs. The Star reports that Minister of Government Services Harinder Takhar says the kiosks cost $4 million to deploy, and it will cost $250,000 to remove them. And shutting down the kiosks has one other benefit: If a security breach occurs as a result of using our own computers then ServiceOntario has successfully shifted blame, hasn’t it? Surely there will be a disclaimer in the fine print on the website somewhere! “Permanently Closed” notice Service Ontario kiosk. 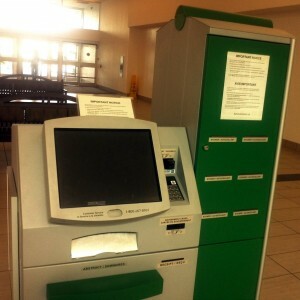 ServiceOntario Kiosks Are Now Permanently Closed. After a thorough investigation into the safety and security issues surrounding ServiceOntario kiosks, it has been decided to permanently shut down the network. Fermeture permanente des kiosques ServiceOntario. À la suite d’une enquête approfondie sur les problèmes de sécurité survenus dans les kiosques ServiceOntario, il a été décidé de fermer le réseau de façon permanente. Résumé de dossier de conducteur. Images courtesy of lothlaurien.ca used under a Creative Commons Attribution 2.5 Canada License license. Thanx to my friend RW for the idea for this post, and her contributions.